A World of Many Hats and Not Enough Shoes - Welcoming a New Year with a Bang! Welcoming a New Year with a Bang! It was New Year's Eve. I was driving home from running errands and thinking about how much I loved our Volvo and how thankful I was for it. It was fancier than any car I had ever owned and I was still in shock that it was my car. I was amazed by how well it worked, what a great price we had gotten on it, and was excited to drive it forever. My heart overflowed with thankfulness for this car, silly as that seems. In rare form, I had parked it in the street when I got home because we were helping a family by giving them our old washer and dryer. I kept thinking, "I need to move the car back to the driveway," but never did. Josh and I had plans at 8:30pm to go to a Mad Men New Year's Eve Party then drive up to our friend's house to ring in the New Year. At 8:30pm, Josh was still getting his Mad Men self on and I was impatiently sitting in a dark living room. I was twidling my thumbs since I was all dolled up and had nothing else to do but listen to the quiet of our house, when a single car alarm blare broke the silence. I thought it curious, but I continued to sit and wait. At 9pm, we could finally leave. Josh went out to the street to warm the car and bring it back to the driveway. He immediately came back to the house and said, "Our car has been hit, we need to call the cops." What the?! I went out to the dark street and sure enough, the driver side of the car was all bashed in, the car was pushed up onto the curb, and the passsenger side front wheel was all bent and whacked up. 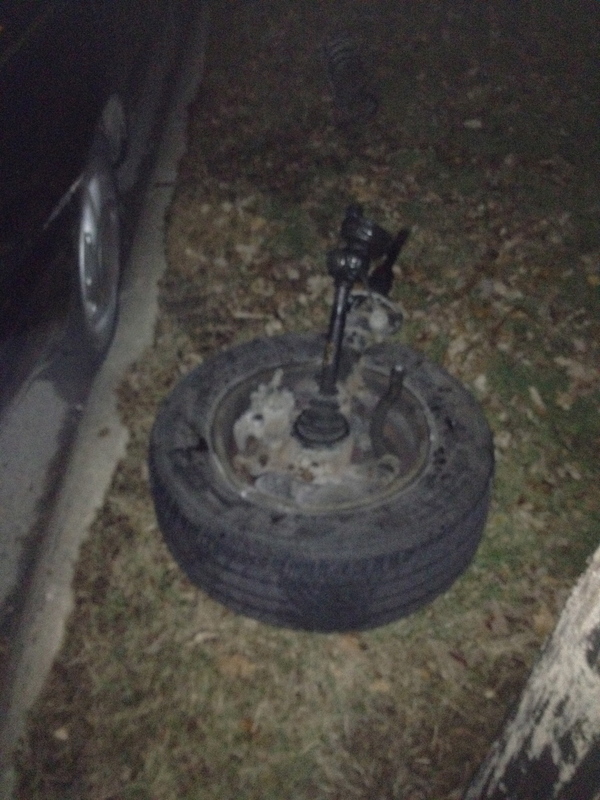 As we walked along the sidewalk, Josh talking with the police on the phone, we noticed other odd things by the curb: random car parts, a huge coil, and an entire wheel with part of its axel. We also saw that another car had been side-swiped. I started going door-to-door trying to find out who owned the car that got hit and possibly if anyone saw anything. Everyone recounted hearing a loud noise and a single car alarm, but that was it. It was an out of town guest at our next door neighbor's party who had the other damaged car. When the policeman arrived, we made mention of the random additional car parts on the road, curb, and sidewalk. He thought it must have been a pickup truck hauling old car parts and they fell out of a truck when it hit us. Josh was convinced it was related. Proving Josh's hunch correct, over the walkie-talkie our policeman got word of a curious situation. 4 miles down our road, another policeman found a man standing on the side of the road with his car on fire. The man was so drunk he didn't know why his car was on fire. His car was on fire because he was missing a wheel. The man didn't know what happened to his wheel. His wheel was back 4 miles in front of our house. He drove 4 miles in his car with only 3 wheels. All I could think was, I'm so glad that man did not kill anyone! He was so drunk he wouldn't have known. He didn't know he was driving on 3 wheels, he didn't know he hit our cars, he had completely blacked out. And then all I could think was, I'm so glad we didn't leave on time! He could have hit one of us or the kids. The car alarm I heard at 8:30 was our car alarm. We were scheduled to leave at 8:30. Whoa. The next day, I got a call. A man was weeping uncontrollably on the phone. He was apologizing profusely. It was the man who hit our car. Josh spoke with him at length and took the opportunity to speak truth to him. While upset about my car getting trashed, the truth the whole ordeal spoke to me was the reminder that our car, like our house, like our stuff, are just things. It's only a stupid car. I could have lost considerably more that night - my husband, my children, my life. 2012 was off to a rough start but I was thankful beyond measure for the things people that are truly important. No Responses to Welcoming a New Year with a Bang!